The art of Cyber forensic investigation is quite complex and requires rigorous precision in following every investigative step from Acquisition to Analysis & Reporting. Experts now face the need for dependable tools that help them to do so, from the beginning. Every investigation requires usage of multiple tools, dependence on a sole tool causes the investigation to lose its flexibility and makes it prone towards ambiguity. So, in this article, we have explained the top digital forensic tools using which the investigators can get best results. When an Investigator raids a crime scene, he is greeted with multitudes of evidence from a computer to a simple mobile. So the examiner requires multiple tools that could help perform hard drive, volatile memory, and network & email forensics. 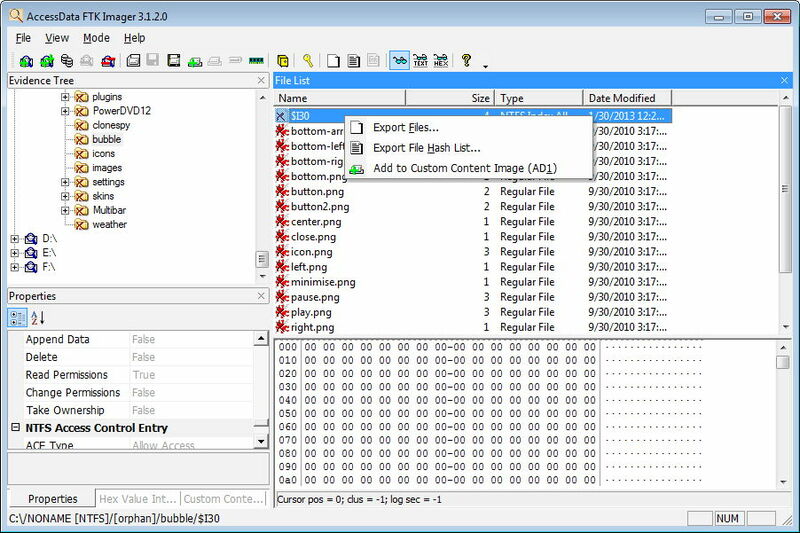 Developed by a German company, the software is based on the concept of Win-Hex which was itself a versatile hex editor, disk editor, ram editor, data recovery and a computer forensics application. The software allows you to image or clone a suspect device forensically. It helps you to read file systems such as FAT, NTFS, EXT, HSE, etc., inside the forensically acquired images. Another reason due to which it is added to the list of best cyber forensic tools is that it allows you to take volatile memory dumps and perform analysis on the same without tampering the memory dump. The software is generally preferred over other tools under the same domain due to its superior and fast digital imaging and processing strength. The advanced filtering and reporting mechanism also makes it the most dependable forensic investigation utility. SANS Investigative forensics Toolkit; based on UBUNTU environment is an all in one package, which utilizes the concept of VMware Computer forensics. It comes pre-configured with all the related tools that need to be deployed in an investigation such as; network tools, memory forensics, etc. It supports forensic image formats such as RAW DD, Expert Witness File format E01 and Advanced Forensic Format (AFF). The key feature of the software is that it supports multiple OS such as Windows, Mac & Solaris due to which it secured its position in top computer forensics analysis tools. It is incorporated with other free tools such as volatility, autopsy, sleuth kit, etc. MailXaminer is the Flagship product developed by SysTools Software, which is an efficient email forensic examination tool. The software runs on Windows platform and supports Web-based, Desktop Based and Cloud-Based Emails. It provisions an investigator to maintain a case repository, scan email evidence and search within them by using search options such as Advanced Search, Fuzzy, Wildcard, Predefined, Regular Expression, Stem Search and much more. 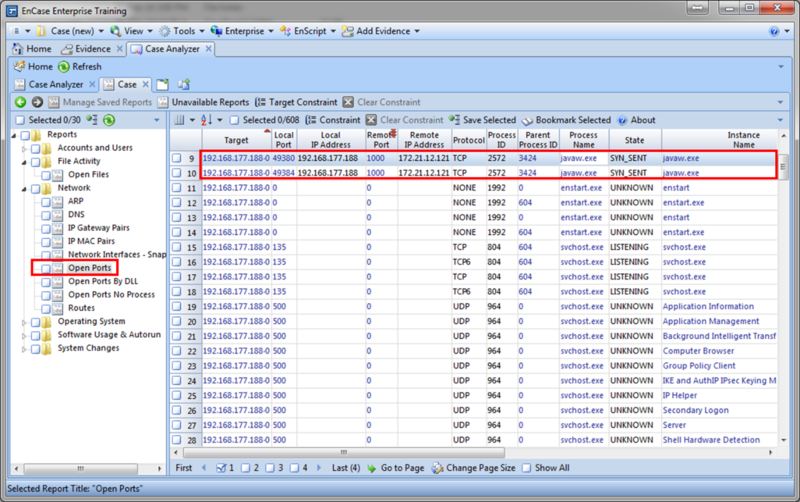 MailXaminer also features an important email forensic feature utilization i.e. Skin tone analysis (detecting obscene Images, especially used in CP) in the suspect emails. The software provides multiple review platforms including SaaS-based review platform, Team Collaboration and reviewing evidence via email or shared location. It also features reporting probative evidence by exporting the emails into formats such as concordance, PDF, CSV, etc. All these features included makes this software the top digital forensic tool. 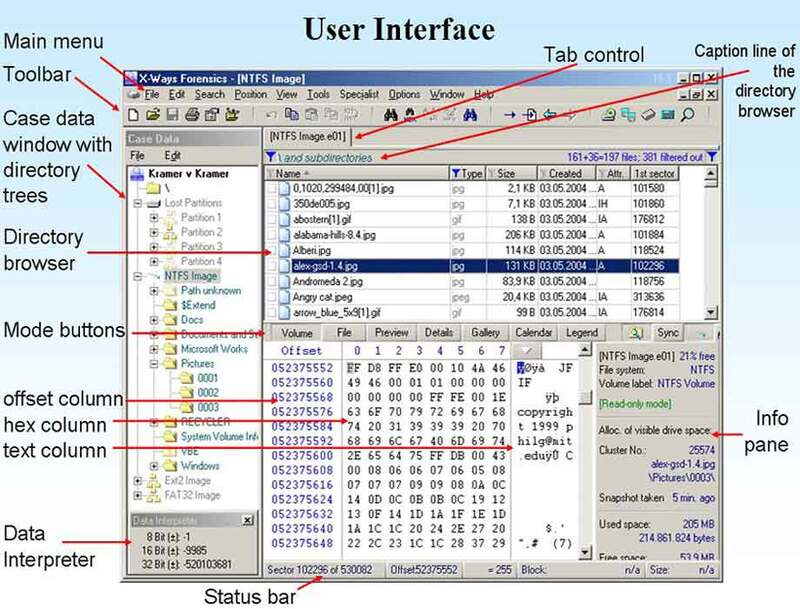 EnCase comes under the computer forensics analysis tools developed by Guidance Software. The software is mainly used for digital forensic machine acquisition, imaging, analysis and reporting of the evidence. It generally covers forensic solutions for hard disk, removable media, Smart Phones, Tablets, etc. The software incorporates a scripting facility EnScript, with various APIs to interact with the evidence. It also features a simple review process to share the artifacts and findings with the investigators. 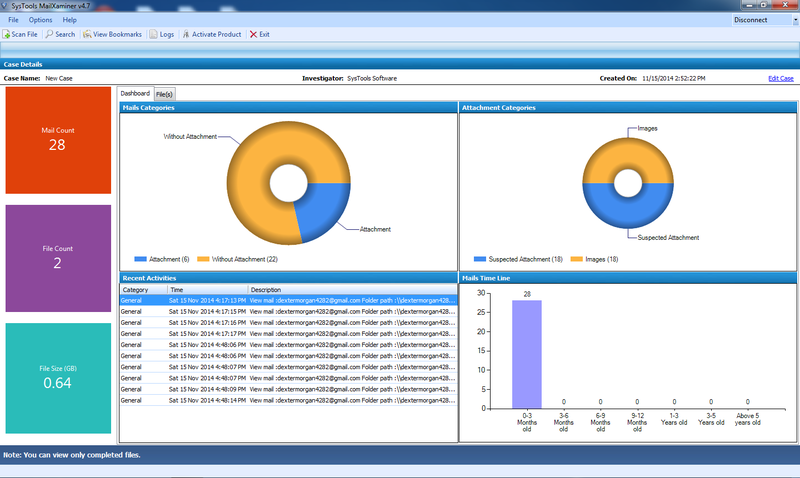 It also gets integrated using its modules to forensics acquisition products such as Tableau. Decryption suites, Image emulators, etc. are all incorporated within the tool. The Toolkit features Registry viewers, Forensic toolkit, Password recovery toolkit and FTK Imager. Volatility stands amongst the dedicated tools developed for memory forensics, it helps you take volatile memory dumps, analyze the digital artifacts from them. It enumerates process lists, network connections, open ports, cached hives, open process, etc. It supports ram dumps from Windows 7, 8 and also from all the major 32 and 64-bit versions. The software also helps to analyze hibernation file (hyberfile.sys), virtual machine snapshot, crash dumps etc. Plugins such as Psscan, DllList, Kpcrscan, etc. helps to correctly identify system profiles, analyze malware, rootkits present in the system memory and much more because of which it secures its place in top digital forensic tools. FTK Imager comes under the Access Data Forensic Toolkit, specially developed for digital forensic imaging, mounting, and analysis. It runs without installation and creates an image using the common formats such as raw (dd), SMART or E01 file format. Besides GUI interface, it also provides a command line version for operating the tool. 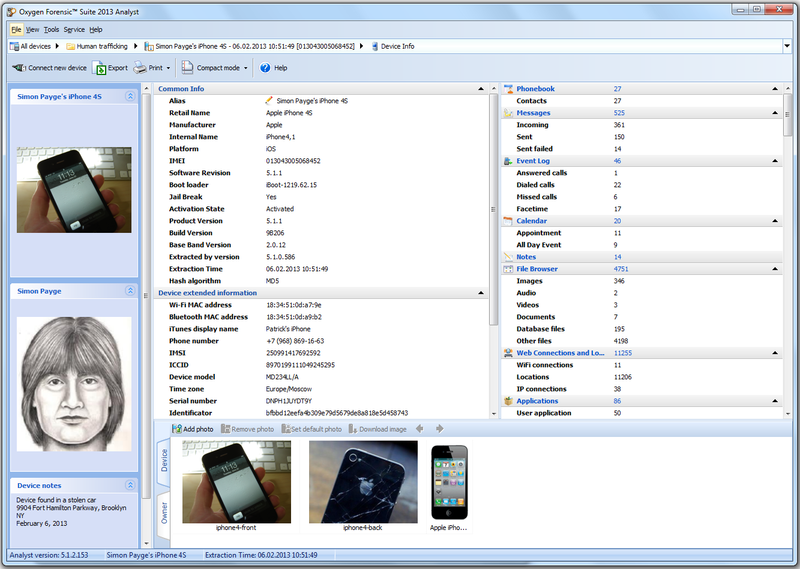 Features such as adding evidence items, mounting acquired images using read/write blocked mode extends user’s capability to perform investigation without tampering the evidence. 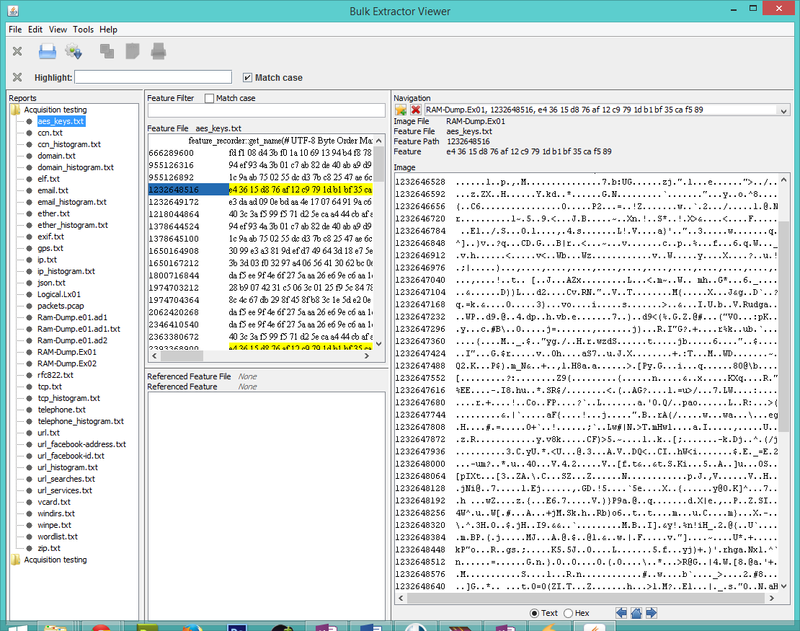 It also serves as a HEX viewer/interpreter. Bulk Extractor generally serves the need to scan a forensically acquired disk image and extract viable information from the same. It does not parse the file system or structures as such, but the results obtained from the tool can be easily parsed, processed with automated tools. The software is generally known for its speed and meticulousness towards the details. Bulk Extractor maintains an output directory that stores the data accordingly and maintains a histogram of the features that appear frequently. The software can be used as a command line tool or a GUI tool. Oxygen forensic software is specially developed to perform a logical analysis of mobile devices, cell phones, PDA(s), etc. The suite helps to extract crucial information out of the mobile device such as messages, call logs, events, calendar data, event logs and much more. The suite features timeline analysis, social interaction map, detects user passwords and decrypts them respectively. The tool provides support for common mobile devices such as Android, iPhone, BlackBerry, Sony, etc. And allows physical acquisition of the device to discover artifacts inaccessible to detect through logical acquisition. Oxygen forensics also has many miscellaneous utility features such as tracking device owner’s movements, analyze application data and helps to report the findings respectively. Xplico is an Open source network cyber forensics analysis tool which functions by reconstructing the data accumulated using Packet Sniffers. The software identifies POP, SMTP, IMAP, HTTP, VoIP, MSN, IRC etc. protocols. One of the best features of Xplicio is that it is able to reconstruct data from large-scale PCAP data. The software gets incorporated by default in the digital forensics and penetration testing environments such as backtrack, deft, Cert (Linux forensics), etc. It outputs data and information in a SQL Lite database or MySQL database, also the software utilizes Port independent Protocol Identification for each application protocol. 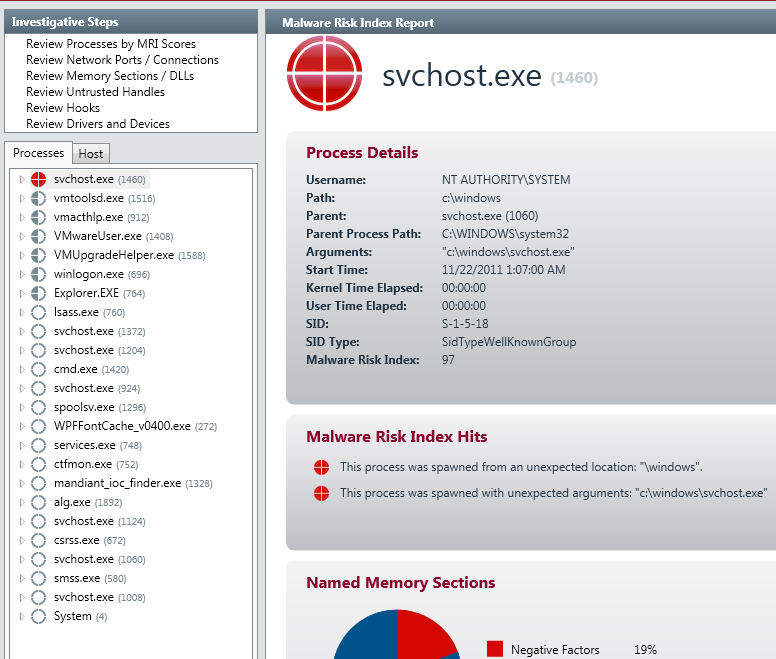 The host investigative tool helps to analyze and report the presence of malicious activity using memory and file analysis. It also helps to develop a threat assessment profile by auditing the running process, network information, user activity, tasks, web history etc. The software assesses process and activities using Malware Risk Index score and helps to sort out the processes worth investigating. Features such as Time Crunch and Time Wrinkle help to filter the results on the basis of timeline analysis and assess the malware activity. All these features are the reason, this computer forensics analysis tool secures its place in the list of top digital forensic tools. Cyber Crime Investigator, legal practitioner or researchers require a bundle of tools that might be resourceful in an unanticipated situation. The above-mentioned tools are handpicked and are considered as the best & trusted by the practitioners and they do deserve a special place in your Complete Forensic Toolbox. There is a healthy debate regarding few norms that need to be maintained in the mobile forensics and network forensics as these are ever-widening fields, and practically new to everyone. The key to succeed in speedy investigations is to have handy tools like the Top digital forensic tools mentioned above, step by step analysis of suspected arena, proper documentation, and analysis of artifacts will ensure an erroneous free investigation. Tools, however, help you discover digital artifacts and truths circumscribing the crime scenario but only proper utilization of these best cyber forensics tools can lead you towards probative evidence.